Since we know mobile internet usage with smartphones have already grown to a market share that can’t be neglected in our marketing campaigns it is time to start using all of the smartphones’ amazing features. One such feature is ability to read QR codes, the 2-D barcodes that are likely to mark the new era in quick access to additional information. Do you have a printed product catalog? It is easy to include QR codes that will lead to individual product pages or offer a discount. Are you running an ad in a print magazine? Include a QR code to a special landing page on your online store that addresses the needs for additional information that this reader might have. A recent eMarketer study shows that a pretty big percentage of all QR code usage can be attributed to mCommerce. According to the study, 23% of all US based QR code usage is for the purpose of making a purchase. The same study shows that QR codes are mostly used to get a coupon, discount or deal (53%) and access additional information (52%). This data shows that you could really increase the amount of products you sell through your printed materials if QR codes are properly implemented into your campaign. It also shows the importance of creating special landing page for every QR code, since people will expect to be landing on content directly related to where they saw the code, not your website’s homepage or some generic landing page used in all of your campaigns. We recently started using QR codes in our campaigns at Inchoo as well, even though these are not used in Croatia nearly as much as in the US. During the “Career Day 2011”, we printed big QR codes all over our business cards and flyers. I’ve seen people use them, but I also saw people with a big question mark above their head when they saw the QR code. Luckily, we can expect the amounts of question marks above people’s heads to start falling drastically very soon. According to a February 2011 report by Mobio Identity Systems, Inc. usage and adoption of QR codes in North America jumped 1200% in the last six months of 2010! Although the growth in North America is mind-blowing, the global adoption is a bit slower but significant growth can be seen globally as well. The graph on the left is result of the study performed by 3gvision. According to that study, US holds the number one position in terms of absolute number of scans in the time period. Italy holds the second position, but with the growth Hong Kong has I expect it already passed the Italy since the time this report was published. 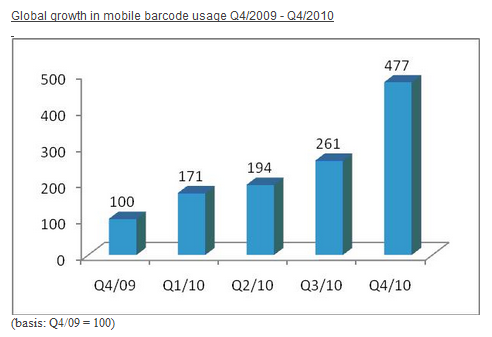 Note that this report excludes Japan, a well known leader in mobile barcode usage. What’s the deal with the daily deal?